South Korea's former President Park Geun-hye has gone on trial for corruption, the latest stage in her dramatic fall from grace. In her first appearance in public since her arrest in March, she arrived at court handcuffed in a prison van. Ms Park, who denies any wrongdoing, is facing charges including bribery, abusing state power and leaking state secrets. She was impeached in March following mass protests. The ex-president is accused of colluding with her close friend Choi Soon-sil to extort money from some of South Korea's biggest companies, including Samsung, in return for political favours. Ms Choi is also facing charges and at the opening of the trial sat alongside Ms Park. The maximum sentence for corruption in South Korea is life. 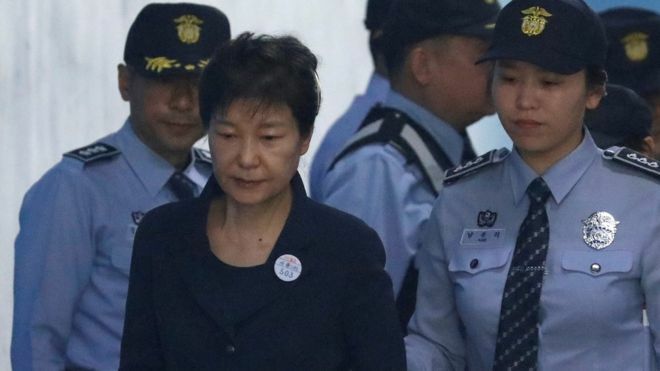 At the start of the trial which will determine whether she completes a transition from the presidential palace to a prison cell, Park Geun-hye was asked what her occupation was. She replied "unemployed". She now faces months of trying to persuade the judges that she didn't pressure companies into giving millions of dollars to the life-long friend who sits alongside her in court number 417, the two separated only by a lawyer. They did not greet each with either a word or even a glance. Ms Park wore a black suit rather than her prison garb. On her chest, worn like a broach: a badge with the number 503 - her prison number. She had a hairclip provided by the prison because her normal hairpins were taken away as potentially dangerous. Ms Park is facing a total of 18 charges including bribery, abuse of power, coercion and the leaking of government secrets. The charge sheet runs to about 120,000 pages, South Korean media report. Ms Choi is accused of using her connections with the president to pressure some of the country's biggest companies to give money to a foundation she established in exchange for favourable treatment from the government. Prosecutors say Ms Park colluded with her friend and that between them they secured tens of millions of dollars for themselves. Ms Park is also accused of leaking state secrets by giving Ms Choi access to her work - including asking her to edit her speeches - and of running a blacklist of media figures who were to be barred from receiving state support because they had been critical of her government. March's impeachment ruling determined her actions had "seriously impaired the spirit of... democracy and the rule of law". Ms Park is the third South Korean leader on trial for corruption but the first democratically elected one. The two previous cases involved former military dictators imprisoned on corruption in the 1990s. Ms Park's hearing takes place in the very same court room as the previous trials. Dozens of people have now been investigated or arrested in connection with the scandal. All have maintained their innocence. Ms Choi, who also denies wrongdoing, has been on trial since December, while her daughter, Chung Yoo-ra - alleged to have received help getting a university placement - was arrested in Denmark in January. The acting head of Samsung Group, Lee Jae-Yong, and four other Samsung executive are on trial for allegedly giving bribes to Ms Park and Ms Choi in exchange for government support for a controversial merger. Former health minister Moon Hyung-pyo and the chief investment officer of the National Pension Service (NPS) Hong Wan-seon are on trial for allegedly pressuring the NPS to accept the merger. And last week, two plastic surgeons who treated the image-conscious former president - including one who injected her with human placenta extracts - were convicted of lying about having treated her. Her removal from office triggered an election that took place earlier this month. It was won by her 2012 election rival, Moon Jae-in.